I will let my ears decide that. Before I toss the box, can someone tell me where the speed adjust tool is? I can't seem to find it after digging for it. @jslcaballo did you ever figure out where the speed adjustment tool is? Pete (@Bananas&blow) has the same question. Have a Planar 6 which is running a hair fast. I would like to try out adjusting the speed on the neo TTPSU but cannot for the life of me find out where the adjustment tool is. Does anyone know where in the packaging the tool is? If I lost it it's just a hex key/allen wrench. Correct? Any help is appreciated. Thanks! Congrats on making my ignore list. Its now got 2 members on it. My brand loyalties? Lol. Its my first Rega. I'm sorry Rega stole your lunch box when you were in grade school. Dmann201 and jon9091 like this. Never did find it. Still tossing the box. Sounds fine to me. Ignorance is bliss I suppose. I've had my Thorens for 2 years now and never checked the speed on it. I can tell it sounds mighty fine and I never notice any speed fluctuations. Not sure how good my ears are at this point so why overthink it. I would like the tool though. I'm 90% sure it wasn't in the box. I dug through every piece like 3 times. But the manual says the size of the Alan wrench, so if I get froggy and want to get the speed down to the 10th of a rpm, I'm pretty sure I've got the tool in my tool box. I'll report back with more info after I log some more hours on the Ania. To those who hate Rega, my experience has been very positive so far. Not sure why this brand draws up so much hate. If you don't like their TT's, don't buy them or pollute their threads. I didn't read Rega threads before I was interested in the brand. jon9091 and Fishoutofwater like this. What made you decide to go with a non Rega wall mount? I would tell you where to find it, but I found mine in the floor a couple days after I set up the table. It is just a small plastic round tool a little over an inch long with an allen head on one end. Comes in a small plastic pouch. Reading your post, made me think to go back to the shipping container and look for it, thought it might be attached to a piece of cardboard that came taped to the top of the NEO but no sign of it. Mabey Rega is not trying to encourage people to mess with the speed and create issues but like you I never thought to check the speed and I really don't care since everything sounds fantastic anyway. Never worried about the speed on my RP3 either and that deck always sounded lovely. Because I've owned the wall mount for 2 years and the Rega for 3 days . When I bought the wall mount I owned a Pro-Ject Debut Carbon. I liked the wall mount better than the Carbon, although it's fine for a starter table. Its actually worked great for my heavy Thorens and the light-weight P6. Both sound excellent on it. I put the Thorens on my dresser in my bedroom setup and it is very grumpy there, maybe have to get another wall mount. Sounds worse and footfalls are a problem. Write to the sound organization who distributed Rega in the USA. Snap a photo send the serial number. They will pop the missing tool to you in the mail. Fishoutofwater, Morbius, chacha and 1 other person like this. If you don’t notice any issues with the speed I would just let it be and enjoy it. Fishoutofwater, Morbius and Bananas&blow like this. I didn't get one in my package either...no manual, no protractor, no other tools...fighting with my dealer since early December. Thanks for this but I first made contact with them a couple of years ago when I had an issue with my new at the time Elex-r and we were able to work it out via email. Lol. Says the guy who kept his last turntable 15 years. Always keep boxes. You will eventually move or want to sell. Boxed items fetch more money and you avoid transit damage with the original packaging. beowulf, Mazzy, Morbius and 3 others like this. YES Especially for tables which are much more delicate to ship. Are you or anyone else using the Rega Wallmount for the new P6. I see on the Rega site that the RP6 and RP8 had to have special adaptors to use this mount. The P6 sounded great on my project wall mount but it doesn't sound quite the same sitting on my dresser. Thinking it needs to be wall mounted, that way I can get it farther from the speaker and off the hard surface. Anyone ? Wallmount the P6? Bueller? I'm using a Rega wall mount bracket with my P6 and am very happy with this setup. In my case I've mounted the bracket to a piece of oak that is mounted directly to the wall studs. I painted the piece of oak to match the rest of my gear. Looking at the Rega website, it appears that they have since updated their wall mount once again since I bought mine. (I originally purchased my Rega bracket back when I still owned my RP3.) 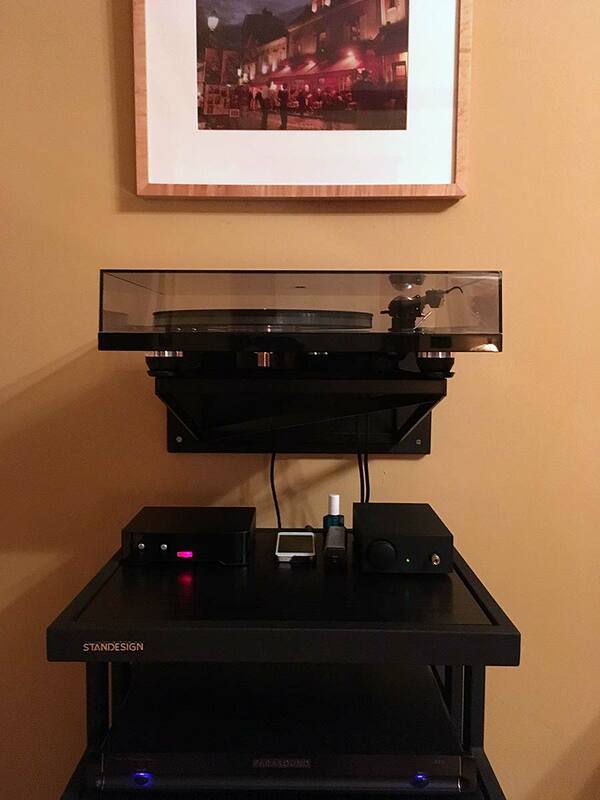 Previously I was using a Standesign wall mount shelf that looked very similar to the one you already own that matched my stereo rack. I personally prefer using the Rega wall mount bracket. With the Rega bracket that I own the feet of the P6 sits directly upon the bracket with no need for any sort of adaptor. With the latest version it appears that perhaps a set of three adaptors are now required. Hopefully your Rega dealer would have that info. rischa, beowulf, Bananas&blow and 1 other person like this. Just like to add that I have never had an issue with anything Rega that I have purchased and that is why I ordered a new P6 with Ania. Opened the box and no speed tool (no big deal), scratched dust cover on the left side (kinda sucked), missing rubber grommets in counter weight (can’t use cant set up) and a tone arm that rattles when tapping on the plinth (big deal) Note: I don’t usually tap on the table but when setting down I noticed something sounded loose and did not know what it was. Getting a replacement sent to me and of course sending this one back. I could not believe the shape this was in and it did not look like it had been opened or tampered with. Very disappointed and let down that this even made it in the box from the factory! Only good I can say is that I am getting a replacement! If there is one thing wrong with the replacement I am sending back and keeping my RP6 with Exact and moving on from Rega! I’m hoping I don’t have to. Dealer has been fast and dealt with this professionally. That's really a bummer gfong. I've been incredibly happy with my P6 just as I am with my RX3 speakers (and my previous RP3 turntable). But that pretty much covers my Rega experience. I can definitely understand your frustration with the situation you're facing. I will add that my dealer likes to set up every turntable they sell before turning it over to the customer. That's what they've done with both Rega turntables that I purchased from them. I have no idea what percentage of Rega tables my dealer might have had to reject because of issues like the ones you've noted. I guess I'm glad that they go the extra mile to make sure that everything is just right. I hope that you are able to get everything worked out to your satisfaction, one way or the other. 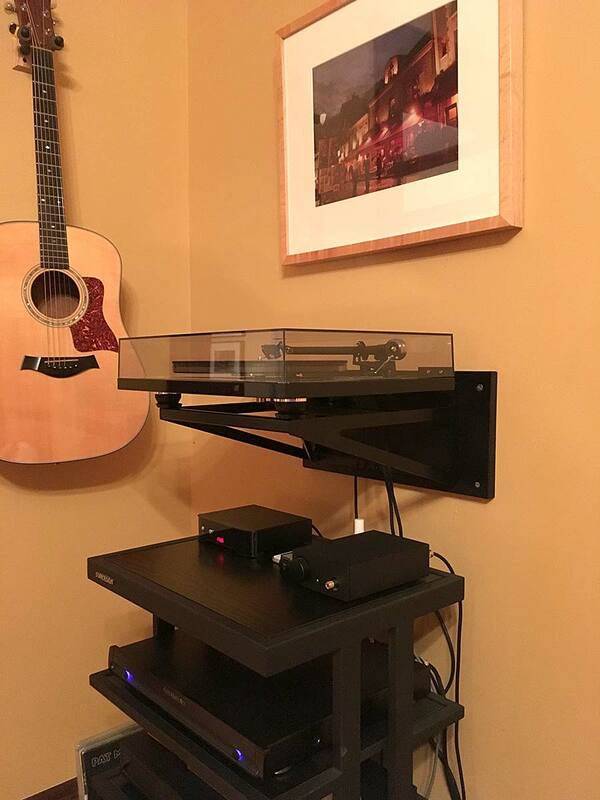 For me the beauty of the Rega is how well it works within the context of my system and room. As much as I love the P6, I realize that there are lots of other great turntables out there these days other than the Regas. I sometimes find it almost comical that so many people try so hard to convince everyone else to go with the same turntable they themselves have purchased. While the P6 worked out great for me there a plenty of different ways to vinyl nirvana and I hope you find yours whether it ends up involving the P6 or not. Sounds like your dealer will make things right one way or the other. Good luck! Much Obliged! System and table look great! I have the slightly newer wallmount with P6 sitting directly on the rack rather than in cups. Supposedly they made it slightly more rigid and lighter than the first one. Works fine. I think they're making another one for the P8 which has a different footprint. I sorta foolishly forgot what our wall construction was like before I grabbed the wall mount (plasterboard -insulation gap- breezeblock) and had to get longer drylining fixtures to fix it through to the breezeblock. Bass increased with the mount, had to reposition my speakers slightly after! I have been tempted to move my system so I can mount it onto an exposed wood structural beam which maybe resonates less than having it coupled to the plasterboard...been too lazy though. I have the slightly newer wallmount with P6 sitting directly on the rack rather than in cups. After viewing photos of the latest rack I was curious how the latest rack works in this regard. I noticed that the adapter mounts were specified for the RP series of decks. I never bothered to look if there were holes in the bottom of the rubber feet on the P6 that would somehow sit on the posts of the latest wall mount bracket. Perhaps you could explain how that works for those contemplating the latest version of the wall mount bracket. By the way, yours is at least the third generation of the rack if not the forth as I know that Rega made at least one other version before the variation that I purchased. I'm guessing that you'll get even more out of your setup if you can get the bracket mounted as solidly as possible.